Data-driven visualization of colliding galaxies created at the National Center For Supercomputing Applications. A growing collection of debris is orbiting the earth, creating hazards that jeopardize both space exploration and the satellite network that powers modern communication systems. These cluttered orbits are the subject of the new film "Space Junk 3D," which features data-driven scientific visualizations created by NCSA's Advanced Visualization Laboratory (AVL). "Since no actual images exist of the most spectacular orbital debris events," explains director Melissa Butts, "we set out to recreate them with scientific accuracy and mind-blowing visualization." Building on previous animations developed for NASA's James Webb Space Telescope project , AVL created two sequences based on scientific data from computer simulations. The first shows the evolution of filamentary structure in the early universe, using data from Princeton astrophysicists Renyue Cen and Jeremiah Ostriker. 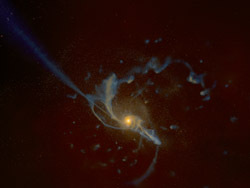 The second features a dramatic collision of galaxies created based on simulations conducted by Brant Robertson at the University of Arizona. "Not only is it cinematic, but it's in 3D, and it's pretty powerful to see these galaxies coming at you, and filling the screen and the room," Butts says. The AVL team designed these scenes using their ultra-high-resolution 3D visualization environment and two key pieces of software they have developed: Virtual Director for interactive scene design and Amore for rendering both volume and particle data. They also used one of NCSA's supercomputers to complete computationally demanding tasks by the production deadline. "It's a real treat to be asked to participate in the making of 'Space Junk 3D'," says Bob Patterson, AVL senior research artist. "It's an opportunity to contribute cinematic scientific visualization to a giant screen science documentary to tell the larger story of natural phenomena in the cosmos." "Space Junk 3D" opens beginning Jan. 13 in IMAX® and other giant screen theaters in 2D and 3D. "Space Junk 3D" is presented by Melrae Pictures, in association with Red Barn Productions. Produced by Melissa Butts and Kimberly Rowe. Distributed globally by K2 Communications, the 38-minute film is available in both 3D and 2D, for Giant Screen and Digital Theaters. For more information, including theater locations, see www.spacejunk3d.com .